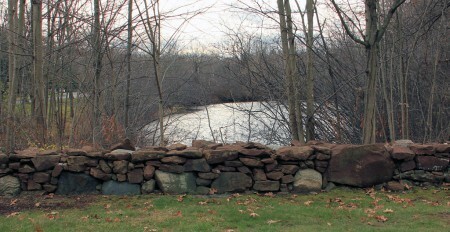 Arizona has its arroyos, Washington its volcanoes, Louisiana its bayous, and New England has its field stone walls. These walls, both abandoned and maintained, are the signature of rural, and urban New England. They crisscross the parks, woodlands and farms of nearly every town and city. Most of these walls are relics of a vanished agricultural civilization that once flourished in farming communities throughout this part of the country. 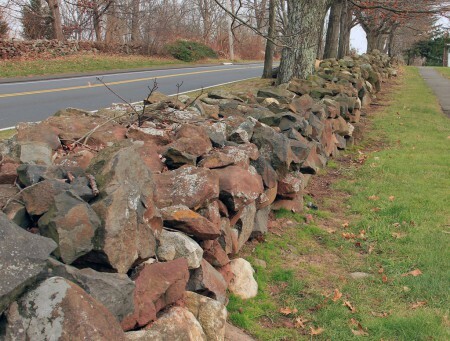 It has been estimated that at one time there were 240,000 miles of stone walls in New England. That is longer than the distance from the earth to the moon. The mass of stone used to build these walls is greater than all of the remaining ancient monuments put together. The majority of them were built by farmers who gathered these glacier dropped stones and moved them to edges of their fields. The original design of these walls was primitive. They were usually thick, low, mortar free, and tossed rather than carefully laid . The raw material from which these stones were formed began as mud from oceans that have long since vanished. In fact, central New England once lay in a narrow sea that disappeared when North America, Africa, and Europe merged to form a super-continent called Pangaea. Before the continents separated again, this mud became deeply buried, squeezed, and sheared into a swirled lump of hot rock. As centuries past this rock cooled, hardened, and decompressed. These conditions transformed this material into hard bedrock, mantled by a clay-rich soil and covered by forest. When a massive sheet of ice, called the Laurentide Ice sheet, invaded New England from central Canada, about 20,000 years ago. It stripped away most of the ancient clay soil and lifted billions of stone slabs, and scattered them across the region. As the ice receded, it deposited a mixture of clay, sand, gravel and boulders ; a type of hardpan soil called “glacial till.” The deciduous forest soon returned and, by natural process buried the stones beneath a thick layer of soil. The stones were there, but most were hidden from sight. Over time the upland New England soil continued to thicken and remain relatively undisturbed during the early European settlement, which began with the Pilgrims at Plymouth in 1620. 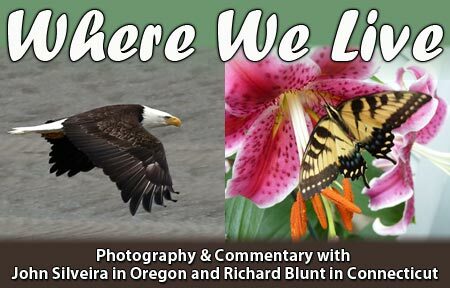 During the last half of the eighteenth century, before the American Revolution, thousands of freedom seeking folks started migrating from their crowded coastal, ancestral villages in Boston, Hartford, Providence, and New Haven, and began establishing settlements in the thickly wooded, upland interior. Their former settlements were somewhat communal, where farmers shared common pastures and tillage fields. In these new settlements, however, land use practices shifted to a pattern of independent, self sufficient farming. This spread a patchwork of private farms over these rich soils. By chance, this rapid spread of farms coincided with the “Little Ice Age;” a climate condition that began about a.d. 1300 and ended in the late nineteenth century. As forests were cleared for farming, the soil became more exposed to winter cold causing it to freeze deeply. This deep freezing caused frost heaving, forcing the stones through the soil, and closer to the surface. Water from spring rains and snow melt could not easily penetrate this deep frozen frozen soil, forcing it to flow over the land surface with erosive force. The water washed away enough the soil to exposing the stones. 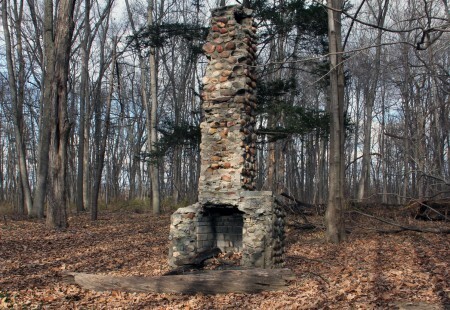 This forced the settlers to clear the stones from their pastures and fields, and find a place to dump them. These early farms had well defined boundaries and required plenty of wooden fencing. These wooden fence lines became magnets for this stone refuse. The farmers carried the collected stones to the field side and tossed one upon the other. The largest stones were pulled, by oxen, on a wooden sled, and rolled into position. 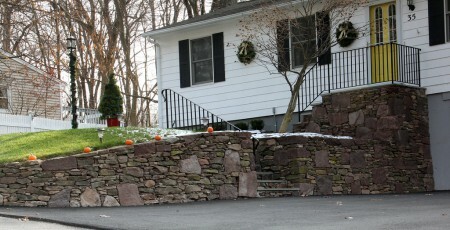 Eventually these crude “tossed” stone walls replaced the wooden fences. Many of these early walls were rebuilt into more eye appealing forms as farm populations rose and surplus labor became available. However crude or well built the walls were, the majority of them originally functioned as linear landfills for this nonbiodegradable agricultural refuse. These walls also helped to improve local wildlife diversity, by providing more dry-land habitats for animals and plants that were adapted to cliffs and ledges. 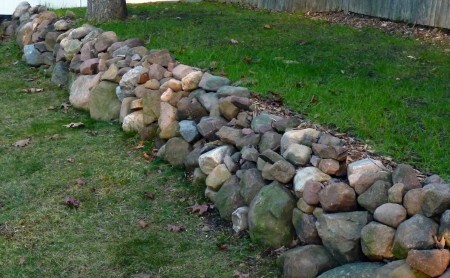 I recently built one of these crude stone walls, in my back yard (pictured bellow), to correct a problem of soil erosion. The stones that I used came from a garden that I dug a while back. Before being incorporated into this wall, they were stacked in an ugly pile on the side of my house. This 40 foot wall of stones has become home and playground to a host of little critters, birds, squirrels, chipmunks and a few other that I have yet to identify. While I was tossing this wall a neighbor was having the natural stone retaining in front of his house rebuilt by a professional stonemason. As the summer went my curiosity over the many stone wall in my neighborhood began to grow. After the fall harvest Kolp Gardens had little to photograph, so I began walking around my neighborhood, with camera in hand, looking for stone walls of interest. What I discovered was a wealth of history and lore that has eluded me for the twenty five years that I have lived in the Farmington Valley. All of the photos below were taken within a two mile radius of my house. 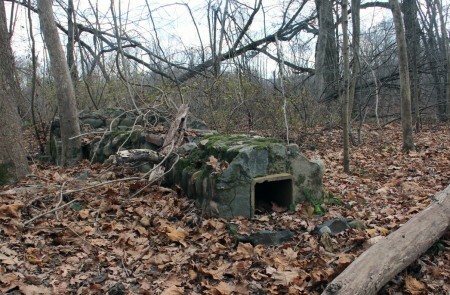 Each photo clearly reveals a use of field stone that was retrieved from one of the past or present farms in this area. Two of the walls were built 1863 by the great grandfather of the current owner of the property. A few of the walls that I discovered were well maintained but the majority were abandoned and in decay. 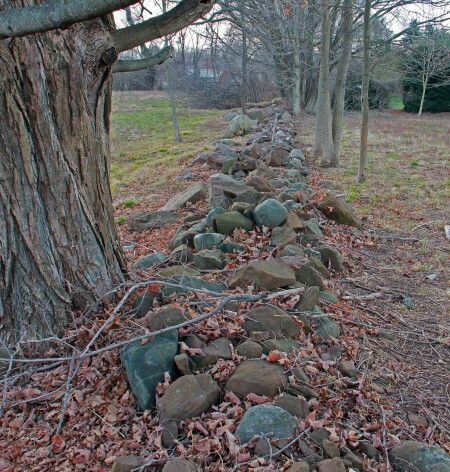 The story of New England’ s stone walls is a very old one. There is much to discover beneath the obvious differences in these magnificent field stone structures. I invite you to join me as I explore this phenomenon in the coming months. Basic stone wall in my back yard. An example of a mortar free stone wall laid by a professional. A farmer tossed stone wall on the Krell Family farm. 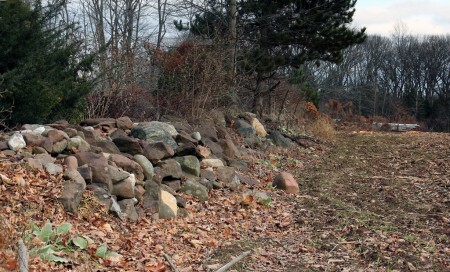 A crumbling wall marking the western boundary of an old farm owned by the town of Farmington. Two views of an abandoned wall that I discovered on a recent hike. The discoloration on the stones is lichen, a complex plantlike organism made up of algae and and moss growing in a cooperative relationship on the surface of the stone. 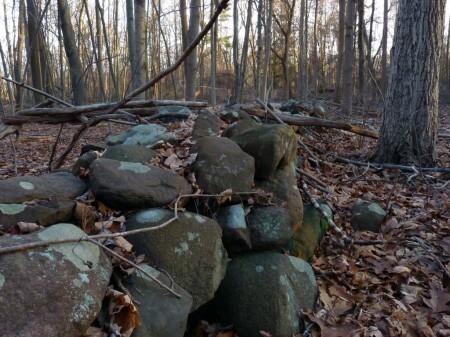 This is a classic example of the many collapsed walls found in New England’s forests. The two walls pictured here were built in 1863. 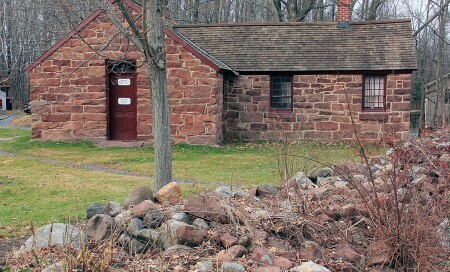 Most of the material in these walls is red sandstone, which unique to the Farmington area. 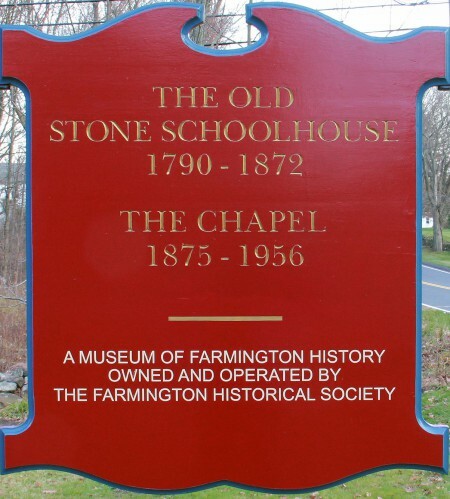 The Old Stone Schoolhouse was school for Farmington children from 1790 to 1872. I also served as a chapel and community center. The stone wall in the foreground is a boundary marker, built in 1863.